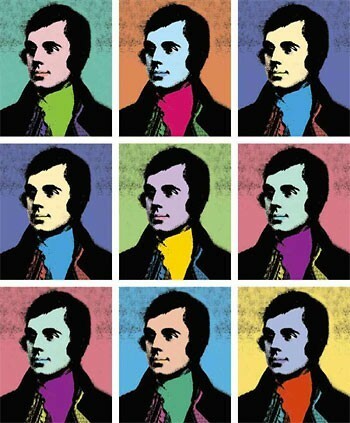 Rabbie Warhol incorporates a design created by Sheilagh Tennant for the “Inspired 2009” exhibition of contemporary visual art she curated for that year’s Scottish Government’s Homecoming Scotland event which marked with the 250th anniversary of Burns’s birth. With generosity from the artist we were pleased to offer unframed prints for sale at $40 each with a portion of the proceeds to benefit The National Trust for Scotland Foundation USA. This offer is no longer available through the Foundation, however if you are interested we would be more than happy to connect you with the artist directly. Please email mail@ntsusa.org for details. Following on from Inspired 2009, Sheilagh was invited by the National Trust for Scotland to curate and manage a program of contemporary exhibitions offering new interpretations of Burns at The Robert Burns Birthplace Museum in Ayrshire. This was the first dedicated contemporary art program at an NTS property and was partly funded by Museums Galleries Scotland. The exhibit ran from May 2012 to October 2015. These exhibitions attracted artists of the calibre of Dalziel and Scullion, Graham Fagen, Kiki Smith, Joanna Vasconcelos and Rachel Maclean. Currently Sheilagh is working towards the launch of Unbroke by Rules of Art – a pilot for a small contemporary multi-arts festival, celebrating the variety of artistic and performing practices currently on offer in Scotland, and beyond, through the unique prism offered by new interpretations of the life and work of Robert Burns. This project is a partnership between Sheilagh and Summerhall, which will ambitiously develop the potential of this unique venue for a multiplicity of arts activity under one thematic banner. The primary aims of Unbroke by Rules of Art will be to present a diverse program of creative responses to Burns from visual and performing artists in order to explore Burns’s status as a ‘Scottish icon’. By widening the response to his mythologizing in our culture, audiences will be able to experience the many ways in which artists find vitality and relevance in Burns’ life, work, and status nearly 260 years after the birth of this iconic figure. The innovative visual arts program features over 30 visual artists, including Graham Fagen, Laura Ford, David Mach and Harland Miller. There will be newly commissioned work by Derrick Guild, Ciara Veronica Dunne, Robert Powell and Ross Fleming. In addition, the focused program of events includes an Alternative Burns Night with Neu! Reekie!, spoken word performances with Rally & Broad and music programmed by Jamie Sutherland of Summerhall’s Nothing Ever Happens Here live music initiative. Interdisciplinarity is at the heart of this project and new synergies will be offered to a diverse audience, providing a unique experience of contemporary interpretations of Scotland’s national bard. Unbroke by Rules of Art will take place at Summerhall where the visual art will be on display in 11 galleries for six weeks, from January 25 – March 10, 2018, with the majority of performance events focused around the weekend of January 27-28.